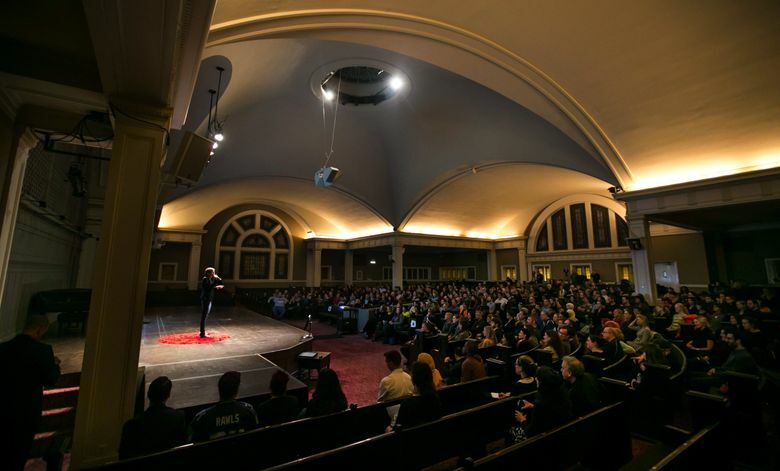 Eleven speakers presented five-minute talks at our Ignite Education Lab event at Town Hall Seattle last Thursday. On Thursday, more than 350 people gathered at Town Hall Seattle to hear 11 speakers present inspiring and surprising stories about their experiences with education. If you missed the event, or if you want to share the talks with friends and colleagues, we’ve collected videos of all 11 speakers below. You can also read a recap of the event here. If you attended the event, please give us feedback about what you liked and what we can improve in the future. Fill out our survey here. Kristin Leong is a speaker, writer and teacher-leader with the Puget Sound Educational Service District. The New York Times named her one of three “Graduates Already in the Driver’s Seat” in 2003. Her project, “Half on mixed race identity in America,” was nominated for a USA Today Outstanding Academic and Intellectual Endeavor award. She teaches middle-school humanities at the International School in Bellevue. Follow her on Twitter @kristinleong and connect with her on LinkedIn. Evan McKittrick lives on Beacon Hill in Seattle and is vice president of quality, impact, and partnerships for the Boys and Girls Clubs of King County. He volunteers as a Big Brother, and has experience with Ashoka Seattle and Teach for America. He believes in the potential of all kids and aspires to help level the playing field locally and beyond. Kent Palosaari is a marriage and family therapist in Bellevue and Renton. He’s the incredibly proud father of a wonderfully resilient 4-year-old, Mirabella. She is the product of years of effort, expensive procedures, and love between he and his beautiful wife, Trina, a high school special-education teacher in the Highline School District. Arielle Effenberger is an 18-year-old senior at Scriber Lake High School in the Edmonds School District. She is from Seattle and began attending Scriber Lake last March, where she met teachers who filled her with hope. Sheeba Jacob has been an educator for more than 15 years. She has taught middle- and high-school students in Washington D.C., Brooklyn and India — in schools and in tents. She is now director of programs at the University of Washington’s Center for Educational Leadership and loves thinking about learning opportunities for educators. Sean Riley: Diversity is uncomfortable! Diversity is awesome! Sean Riley, born and raised in Seattle, is a National Board Certified language-arts teacher. For nine years, he taught at Global Connections High School in SeaTac. This year he teaches at Catharine Blaine K-8 in Seattle’s Magnolia neighborhood. In 2014, he earned The Evergreen State College’s Distinguished Educator of the Year award. Saraswati Noel is a math educator at Seattle World School, a public middle and high school that primarily serves immigrant and refugee students. She is committed to diversifying educational materials by creating a space where all voices are able to contribute to the growth and development of public pedagogy, especially in the field of mathematics. In addition to creating fun, engaging, student-centered and culturally relevant curriculum, Noel is passionate about immigrant rights. As a teacher-leader with the Puget Sound Educational Service District, she loves connecting with others who have similar passions. Follow her on Twitter at @saraswatinoel. Mariah Valles is a sophomore at Auburn High School. She is managing editor for the Invader, her school’s yearbook, and she hopes to teach journalism one day. She is also part of Education Lab’s Student Voices project. Tali Rausch: Washington State!?!? You’re being fined $100,000 a day and you still can’t figure out how to fund public education??? Rausch has three children who attend Seattle Public Schools. She serves on the board of directors for New Discovery Preschool and Cascadia Elementary PTA. Most recently, Rausch joined the steering committee of Washington’s Paramount Duty, a grassroots group that advocates for full funding of public education. Rausch has worked for more than 20 years in the nonprofit sector. She holds an M.A. in Urban Policy and Planning from Tufts University and is a Class of 2015 Leadership Tomorrow graduate. Ifrah Abshir is a senior at Rainier Beach High School who is passionate about social justice and equity. Her family of 12 is her support system. She aspires to become a doctor and eventually move back home to Somalia to practice medicine. Guerrier is a cultural worker and executive director of 21 Progress, a leadership nonprofit for young leaders and bold ideas. He has spoken at the Seattle Mayor’s Youth Opportunity Summit, TEDxSyracuse, TEDxUtica, and colleges and cultural centers across the country. He is the author of Love Poems Can’t Eat Bullets and the forthcoming book Even After. He likes giving away books to new friends at mgspeaks.com.